The Dalhousie School of Information Management (SIM) invites applications for a three-year term appointment at the Assistant Professor level commencing 1st July 2019. Dalhousie University (http://www.dal.ca/) is one of Canada’s leading teaching and research universities, with four professional faculties; a Faculty of Graduate Studies; and a diverse complement of graduate programs. Inter-faculty collaborative and interactive research is encouraged, as is cooperation in teaching. Dalhousie University inspires students, faculty, staff and alumni to make significant contributions regionally, nationally, and to the world. Dalhousie University is located in Halifax, Nova Scotia, Canada. Halifax is a vibrant capital city and is the business, academic, and medical centre for Canada’s east coast. Strengths in teaching at the undergraduate level. Successful experience with graduate teaching, as well as with online course development, tools, and pedagogy, will be an asset. Ability to lead a number of special projects assigned by the Bachelor of Management Program Director, including online course development. PhD and research experience in Library and Information Studies, Knowledge Management, or a related field (such as computer science or information systems). Review of applications will begin on 15 May 2019 and will continue until the position is filled. You are strongly encouraged to submit your application by this date. 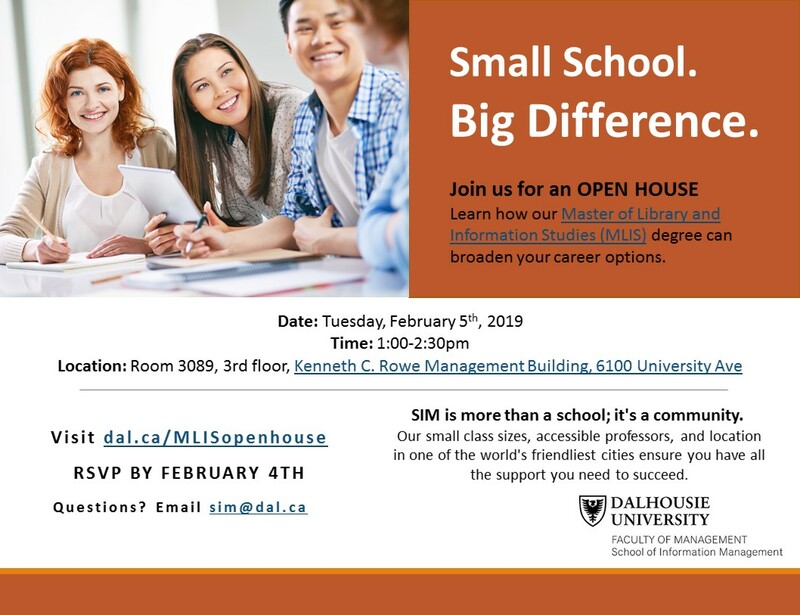 The School of Information Management (SIM) invites applications for a 10-month limited term appointment, ideally commencing June 1st, 2019. MLIS or equivalent degree related to information management. A PhD (completed or in progress) related to information management, will be an asset. Experience teaching at the graduate level is required. Experience in undergraduate teaching, as well as with online tools and pedagogy, will be an asset. Professional experience in the private or public sectors as a qualified information management professional will be an asset. Research experience relating to the private or public sector will be an asset. 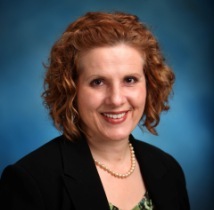 Please join the School of Information Management (SIM) in congratulating Dr. Louise Spiteri on her promotion to Full Professor. The rank of Full Professor is awarded to faculty members who have demonstrated a high level of effectiveness in teaching and who have gained wide recognition as a contributor to their discipline or profession. Throughout her time with SIM, Dr. Spiteri has demonstrated excellence in teaching, research and service. Dr. Spiteri has consistently received high SRI scores, as well as extensive praise and recognition from students for the quality of her teaching, her strong organization, preparation, and planning, and her ability to engage and excite students. Dr. Spiteri is known for her comprehensive and relevant feedback to students, as well as her responsiveness. Her assignments provide a mix of theoretical and practical elements, and students comment on the utility of her courses in the workplace, and throughout their careers. Dr. Spiteri’s research involving knowledge organization, social tagging, and linked data has expanded with the changes in the field and has helped shape scholarship within the discipline. Most recently Dr. Spiteri has co-edited, and contributed to two books that have moved forward the research agenda in her field. Dr. Spiteri has been a generous and active contributor to SIM, and the Faculty of Management, including her time as Director of SIM. Dr. Spiteri has also had a significant impact in key information associations, in particular, the Association for Library and Information Science Education (ALISE), where she has had numerous roles included President. ALISE recognized Dr. Spiteri’s contributions, awarding her a Service Award. 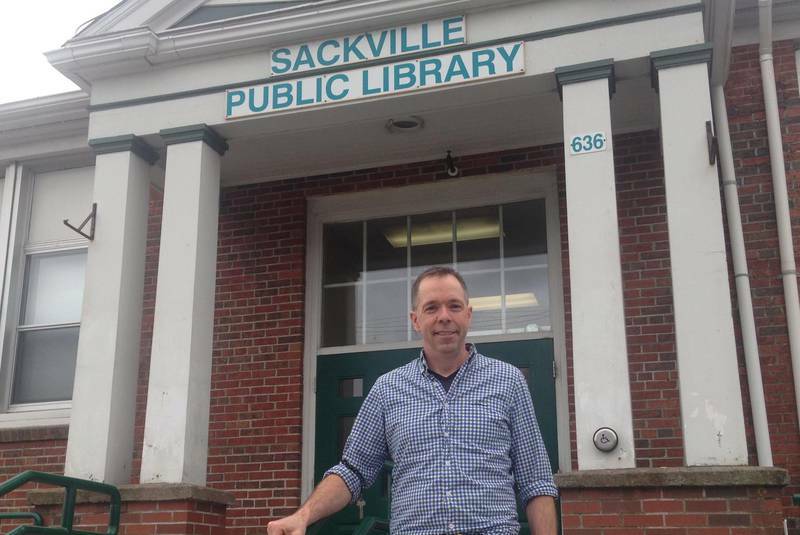 MLIS alumnus Ken Williment (’06) was recently profiled in the Chronicle Herald for his work as the branch manager with the Sackville Public Library. Check out the SIM Lending Library today! Did you know there is a small lending library in the SIM admin area? The library is located in Suite 4010, between offices 4013 and 4014. All faculty, staff and students are welcome to use it at any time. 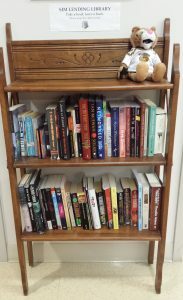 Important: The lending library operates on the honour system – users are asked to “take a book, leave a book”, meaning if you borrow a book you must replace it with another. Please do not leave a book unless you can also take one. We want to ensure the stock is regularly refreshed and that staff do not have to spend time organizing the shelves. This library is open to everyone, but in turn that means everyone must work together to respect the system and keep it tidy. 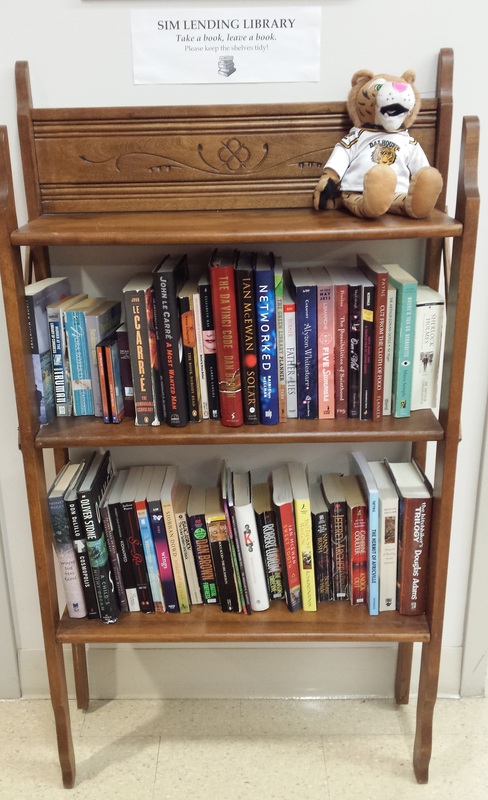 Using the lending library is the perfect way to discover a new book or pay a much-loved book forward to someone else, without stretching your budget or storage space. Come check it out today. We are pleased to announce the re-launch of our blog – now called “Inform”. Feel free to explore this site and share with your networks. Information is what we are all about. We are passionate about data management, information literacy, accessibility, preservation, connecting communities and many more current information topics. This blog is a reflection of that passion: Stories from our community of innovative information managers who are turning their knowledge into action, within Dalhousie and beyond. Join the conversation by sharing, commenting or contacting (submissions welcome*). Our goal with the re-launch of our blog is to foster more frequent, engaging and interactive communication within our community. In represents a transformation of our newsletter “Inform” We hope to keep all that you love about Inform, while adding new and dynamic features. A complete archive of all newsletters can be viewed on our website here. Unfortunately there is currently no way to subscribe, however the Dal Blog Team is working on making this possible. In the meantime, we recommend you save the blog link somewhere accessible. Our goal is to include more regular content written about and by you – our community. What kind of stories are we looking for? Think about the following – What has excited you in the past six months? Have you attended an interesting conference? Worked on a fascinating research project? Completed some rewarding IM-related volunteer work? Received a promotion? Had your work published? Got married? Had a baby? In short, anything that you think might interest your fellow students, faculty, alumni and professionals, we want to hear about! We accept submissions anytime. Send your updates to inform@dal.ca (SIM faculty: please post directly to WordPress). Monthly reminders will be sent through our networks. Please review the Blog Manual (available from Admin Assistant) before writing or submitting anything (note: only faculty and students with special permission are able to post directly to WordPress). Contact us at any point if you have questions (inform@dal.ca). We hope that our new blog will be a fun, engaging forum to celebrate the stories of our many amazing people and projects. The latest issue of SIM’s newsletter Inform is now available on our website here. This issue contains stories about what our students, faculty, alumni and partners have been up to since January. 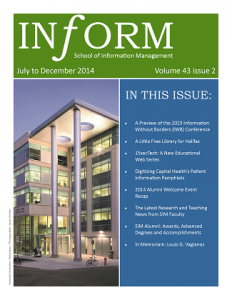 Inform is published twice per year – in January and July. We are always interested in new content, so if you have any news updates or stories you would like to see in the next issue, email inform@dal.ca. To those of you who celebrate then, I would like to wish you a Happy Easter and Passover. I wish all of you a restful long weekend celebrated with family and friends. The latest issue of SIM’s newsletter Inform is now available on our website here. This issue contains stories about what our students, faculty, alumni and partners have been up to since July!